Re: NAZI Railroad Delousing Tunnels for Public Health, or Mass Murder! Thank you for this post. It is of high quality and explains the topic in a very accessible way. I can't imagine how anyone can refute your argument here. In 1982, I could not imagine anyone disagreeing with what I was claiming about the railroad fumigation,tunnels---but. but, but that was long before I really got to know Robert Faurisson. Faurisson was actually furious with me and managed by the strength of his personality and sheer determination to gradually convince many rervisionists that I was wrong and that my arguments had "no value at all." That insanity is represented today by the people at CODOH including "Frankie"--see Frankie's posts on this thread, even from juist a few days ago. Instead of embracing what really made sense, Faurisson formed an entire gang of wackoes including Leuchter and Zuendel and Germar Rudolf to embrace the idea that cyanide was "highly explosive"--even comparable to nitroglycerin-- and that mass gassings were, therefore, simply "impossible" to begin with. Cookoo! The argument of Fritz Berg has no value at all. I have told him that to his face. But maybe you are familiar with this unfortunate man's temper and zeal. Faurisson was telling people that I was not merely wrong--but that I was also somehow deranged mentally for NOT agreeing with him. Even Germar Rudolf supported Faurisson's anger by suggesting at the end of his vicious book review of my book Nazi Gassings that I needed psychological help. Perhaps we all need some help. Last edited by Friedrich Paul Berg on Tue Apr 03, 2018 5:26 am, edited 2 times in total. In actual fact no executee takes a first deep breath. That's what we tell them, but, in fact, the instinct for self preservation takes over and they all hold their breath. Also, Kreislauf would have required equipment that the Alleged Gas Chambers never had, With the alleged method of execution (standing room only foe the executees) Circulation would have been impossible with a constantly interrupted airflow. The 1937 schematic from American Cyanimid in the USA shows how simply any necessary equipment and ductwork could have been added to the Leichenkeller gas chambers by simply punching some holes (at opposite ends of the gas chamber) through the ceilings and adding ductwork externally. Of course, that would have all been visible from the air and to "eyewitnesses" which is definitely NOT the case as far as the holocaust scenarios we have been given--but technically, it certainly could have been done, easily enough, and it would have worked. The greatest flaw in the holocaust story, however, is the endlessly repeated claim that the fans were turned "ON" o-n-l-y when everyone was dead. The fans or circulation blowers were essential during the actual killing of the victims, not just for "venting"--otherwise, there would have certainly been many "botched mass executions." That is a subtle, perhaps too subtle, but definitive answer to the gassing hoax. Last edited by Friedrich Paul Berg on Tue Apr 03, 2018 5:28 am, edited 1 time in total. Leuchter shows his strangely upside-down reasoning again. Kreislauf was used to penetrate densely packed garments. This was the ONLY reason for the use of kreislauf. 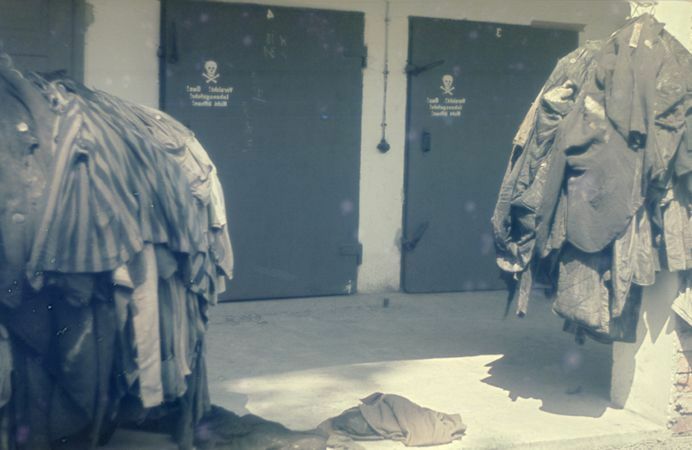 Without kreislauf, it would take too long for the gas to penetrate through the densely packed garments on the rack in the fumigation chamber. Kreislauf is, without a doubt, a BENEFIT to circulation. Leuchter must think a room full of people is more of a circulation problem than the circulation THROUGH CLOTHING! Leuchter is such a charm! Last edited by blake121666 on Fri Mar 30, 2018 7:07 pm, edited 1 time in total. I agree with Blake. Leuchter was n-e-v-e-r an "engineer" to begin with. He lied, repeatedly, about almost everything. Since Leuchter never witnessed even one gas execution, how can he possibly claim as he did above that "no executee takes a first deep breath." How would he know? For that matter, how would anyone know for sure? How does anyone explain the fact that some executees were indeed dead in just minutes, possibly even in seconds, as Germar Rudolf explained in his video? Last edited by Friedrich Paul Berg on Fri Mar 30, 2018 7:48 pm, edited 5 times in total. But, in Leuchter's mind, those clothes had to have followed the "9 square foot rule"! Leucter probably thinks those little fumigation chambers held AT MOST a couple coats, one hat, and MAYBE a tie if it wouldn't crowd things too much! He's an engineer, you know. He knows about these sorts of things. Revisionists should bask in his pearls of wisdom. Intense forced gas circulation, Kreislauf in German, would have been absolutely necessary to kill ALL of any group of intended victims in anything like half-an-hour. But nothing like that is even suggested by either the technical features of the supposed gas chambers, or by any statements from any "eyewitnesses" or "confessors." The greatest flaw in the holocaust story is the endlessly repeated claim that the fans were turned "ON" o-n-l-y when everyone was dead. That flaw shows that rhe supposed "eyewitnesses" and "confessors" are ALL liars--and without their lies, the hoax has nothing. The fans or circulation blowers were essential during the actual killing of the victims, not just for "venting." Without the fans or circulation blowers turned "ON," there would have certainly been many "botched mass executions" with many "survivors." Last edited by Friedrich Paul Berg on Tue Apr 03, 2018 5:30 am, edited 2 times in total. The greatest flaw in the holocaust story is the endlessly repeated claim that the fans were turned "ON" o-n-l-y when everyone was dead. The supposed "eyewitnesses" and "confessors" are ALL liars--and without their lies, the hoax has nothing. The fans or circulation blowers were essential during the actual killing of the victims, not just for "venting"--otherwise, there would have certainly been many "botched mass executions" with many "survivors." Well if we are to claim that Zyklon diffuses faster than it can build up to an explosive concentration, then we are claiming that it travels pretty fast. Consider the case of an outgassing rate of about 80% in ten minutes. This is probably in the ballpark of the evaporation rate at HCN's boiling point of 26C (78F). Berg thinks that HCN evaporates off the Zyklon substrate at least this quickly at HCN boiling point temperature. He has stated he believes the evaporation rate to be even quicker than this at this temperature. Now the initial dosage used for fumigations is about 1% of the volume of the room being fumigated. So in ten minutes that HCN that has evaporated off the substrate (80% of the dosage - which is 1% of the volume of the room) cannot contain more than about 6% HCN (the LEL of HCN). So V10 > 8/60 x V which is about 1/8th the volume of the room. So in ten minutes, the extent of the HCN has to be at least 1/8th the volume of the room or it would be explosive. If it were ONLY 1/8th the volume of the room then it would be concentrated at about the explosive concentration of 6% - which would be very quickly fatal to anyone breathing that in. This is the very slowest the HCN could propagate to avoid any explosion risk - which we are agreed happens with Zyklon. But the 1-minute LC100 of HCN is said to be about 2000 ppm = 0.2% = 2/60 x the explosive concentration of 6% = 1/30. So how long would it be that 1/30 the amount contained in the 1/8 volume of the room reaches all parts of the room? Probably not 30 minutes = 3 times as long as this ten minutes. It most likely would take no longer than 30/8 x 10 minutes = 38 minutes. No longer than this as a maximum. So at about 78F, the natural diffusion of the evaporated HCN would probably be sufficient to kill all within 30 minutes - given that it propagates quicker than it can build up to an explosive concentration. And a packed room would raise the temperature pretty quickly. The diffusion rate most likely FAR outpaces this though. But even if it were ONLY this slow, 38 minutes would be the maximum time to kill everyone in the room. If the diffusion rate were merely only twice this rate, it'd only take about 20 minutes to kill everyone. Hi Blake, thanks for the illustration. I am not sure exactly what point is being made here by the parties involved. I guess I just don't understand Leuchter's objections. In the case of the rack of clothing, the Kreislauf (circulation) causes the Zyklon-B to liberate its HCN active ingredient rapidly by blowing warm air through the granules and then distribute it homogeneously throughout the chamber. Then the forced-air helps blow the gas through the clothing which reduces the time it takes for the HCN to penetrate into all the fibers and kill the lice and nits (eggs) nestling there. The situation is that body lice feed on human blood and then find a nice seam in the clothing to build little nests of poop and nits (eggs). It is the dried poop from lice "vectors" which have been infected by biting and drinking the blood of an infected host that contains the typhus pathogen which is either inhaled by hospital or laundry workers or enters the body of an uninfected person through bite wounds or any other skin abrasions that causes typhus. I don't want to digress here, but this is also why with a threat of epidemic the clothing of corpses needs to be either burned--or fumigated before being laundered if it is salvageable. We see this done in the open in the famous Polish Resistance Sonderkommando photos on bonfires near Krema V. Kremas II and III had trash incinerators which were likely used for this purpose as well. HCN has a low molecular weight and has very good penetration properties which makes it good for fumigating buildings, bedding, and clothing. And with the low (room temperature) boiling point of HCN, this helps it ventilate well afterwards. 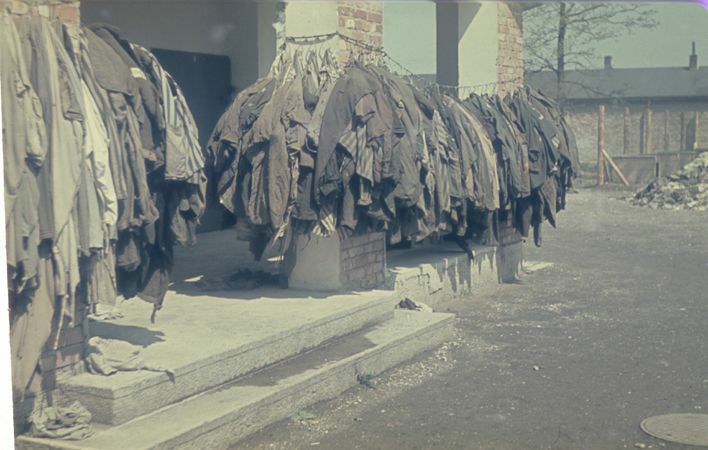 You see the racks of fumigated clothing hanging outside of the fumigations cubicles in a famous post-Liberation photos at the Dachau concentration camp, for example. Most of the literature gives us a cycle time of around 15 minutes for this whole process, which is remarkable. In the homicidal gassing scenario we don't care about the gas penetrating fibers and we cannot force-air through bodies packed like sardines. I guess that is what Leuchter is talking about. But penetration does not matter because in this case the victims breathe in the gas on their own. All we care about here is that 1) the HCN gas is liberated from the Zyklon-B as RAPIDLY and COMPLETELY as possible, and 2) that the gas-air mixture is blown throughout the room HOMOGENOUSLY. The cycle time is going to be quick--maybe a little longer because people can hold their breath, and it takes four-minutes from complete oxygen deprivation before brain death begins to occur with unconscious victims. For a large sample size or other cohort there will be some considerable variation, of course, and some people will try to hold their breath with some success, but rapid and homogenous dispersion of gas in the chamber will minimize the variation. Without any verifiable real-world data using this homicidal gassing scenario, I would guess that it probably would take not more than twenty or thirty minutes at the most. But what's the hurry? The Sonderkommando go for lunch and to sing the Songs of Israel and then clock back in to start the body disposal. We already know that the bottleneck is disposing of the numbers of bodies claimed so the only reason that we are limited on time is because Hoaxster testimony gave us arbitrary and no doubt imagined gassing information based on the contrived industrialized mass-murder narrative. In either situation we don't have a risk of explosion because we never introduce more product into the hermetic gaschamber space then necessary, which is far below the lower explosion threshold. And in the case of natural outgassing of the Zyklon-B, this issue never comes up when fumigating the holds of ships or buildings. Otherwise the practical fumigation literature would have cautioned about such a risk. There is never any reason for fumigators to overdose the spaces in question--but even if they did you would likely get nothing more than a puff like you would if you turned on an old gas stove in a home kitchen for a minute and forgot to relight the pilot light. The combustibility of HCN as provided within the context of the Zyklon-B product is of negligible consequence for practical fumigation--and this is stated in clear terms in the industrial literature. With combustible gas, whether methane, CO, or HCN--or HCN liberated from Zyklon-B, it would not be hard to turn a hermetic chamber into a bomb. But Zyklon-B would not be such a risk of volatility that Leuchter and Faurisson made it out to be. Even with pure oxygen, such as found in hospitals, oxygen tents, submarine or space capsules, etc., you can have risks of fire or even explosion--and yet these operations are still accomplished everyday. The risk of concentrated oxygen at high pressure is a gaffe that was initially overlooked in the Apollo space program, which resulted in a cabin fire during a ground simulation that killed astronauts Gus Grissom, Ed White, and Roger Chaffee on January 27, 1967 and nearly scuttled the Moon Landing program. Real engineers and technicians put an enormous amount of effort into designing workable submarines as well, which is a technology that Germans had a lead in during the World Wars. These concerns have little merit with respect to fumigating with Zyklon-B, however. So I don't really understand Leuchter's objections here. Why do these concerns suddenly manifest themselves when gassing humans instead of other kinds of vermin? All of this Rube Goldberg engineering is derived from making the square pegs of Hoaxster lie-witness testimony jibe with the real world somehow, whether in the case of impossible gassing times, cremation rates, or many other things. Fortunately it is harder to lie convincingly about what one imagines might be observed than to actually observe things and to once in a while get a few observations wrong. The danger here is that some Revisionists need to make slam-dunk arguments that disprove the massively-funded, and propagated, and legislated Hoaxster narrative in toto--and that is an overreach that makes many assumptions, some of which might be wrong. And unfortunately most simpleton slam-dunks lack the nuance and significant detail that means they are easily debunked by real experts. Even more outrageous is when these mistakes and simplifications are caught and the Revisionists or Exterminationists refuse to be corrected. Confirmation bias always has to be guarded against.